With all the recipe experimenting and inventing that goes on at our house (especially recently as we’ve been working on our new Healthy Snacks eBook), you can be certain that we have some fails and flops from time to time. Sometimes a recipe idea turns out tasty but ugly, sometimes a recipe is not tasty in the least, and sometimes it’s both not tasty and it’s ugly. Bless its pitiful little heart. Like I normally do with “leftovers,” I put the bread into the freezer. I’m not sure why I did this, because dare I remind you of the nastiness? It’s just hard to throw away food and hard work. Maybe I thought the freezer would settle down the bitterness and bring out the sweetness – as if my freezer has a magic wand. Hey, I figure if lasagna and spaghetti can taste better the next day, surely bitter bread can find a way to taste good. I realize none of this makes sense. Several weeks after baking and freezing the pitiful bread, I cleaned out my freezers. Wouldn’t you know it? Shoved in the back I found a bag with two of these delightfully gross loaves of bread. It had been in there too long, so not only was it likely to still be bitter, it was also freezer burned and crumbly. I’m telling you, I really nailed this one. I walked to the trash can. “Just do it,” I said to myself. I could bury it under the other trash. No one would ever know. Ugh, I just couldn’t do it. I decided that my family had by now forgotten how terrible the bread had tasted, so they wouldn’t be afraid to try it in a “re-purposed” breakfast. Maybe? Hopefully? Guess what? 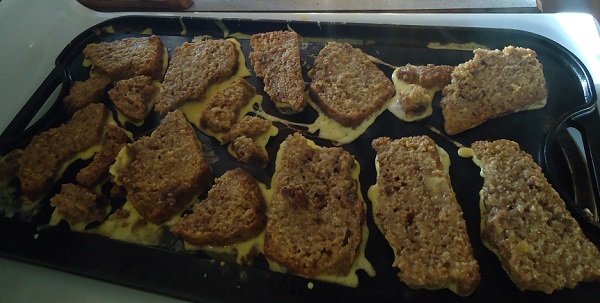 Nasty, bitter, crumbly quick bread – when soaked in egg and milk and cooked in butter on a griddle – makes a wonderful (yet more than slightly messy) French Toast breakfast. Without blinking, my family ate both loaves of this interesting looking French Toast. Butter and real maple syrup make anything better, right? Well, at least in this case it worked. I’m sure your life is enriched by hearing that inspiring story. I have no recipe to share this time (for obvious reasons, you’re welcome). I can’t even give advice based on my bad experience. But if at all possible, I do encourage you to try to make use of a recipe flop. There really is likely a good way to use up the food so you don’t have to throw it away. But one more thing: Never stir 2 cups of salt into your cookie dough. Paula Deen herself wouldn’t be able to figure out a way to repurpose that one. Here are all the recipes that DID make the cut! 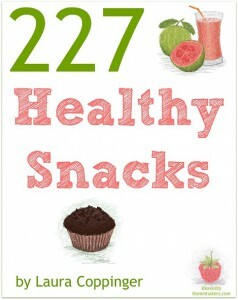 Get our 227 Healthy Snacks eBook while the price is still cut in half! Get your 227 Healthy Snacks eBook for just $4.00! One day I made a big batch of blueberry muffins. Unfortunately, I forgot to grease the muffin tins and they came out in a million pieces. There wasn’t a piece big enough to really eat but it seemed a shame to throw out perfectly tasty muffins just because they fell apart. So I looked around the internet and finally decided to try making bread pudding with them. It was delicious! I’ve actually been a little disappointed that all of my muffins have turned out and I haven’t had the opportunity to make it again. Were you spying on me? ;) Just tonight I made whole wheat bread. I grind my flour and i realized once it was all mixed up that I used pastry flour! So frustrating! I tried rolling it out like crackers, but usually when I add other ingredients I just end up wasting those too! The other day I made whole wheat tortillas that were tough. I decided to bake them to make them crispy but they puffed like pitas instead – so that night we had pita tacos! They were great! I did something similar with cookies the other day. The dough was really good, but after baking they were baking soda nasty. Fortunately, I have pigs and chickens, so any kitchen “waste” simply goes to feeding our future food. I won’t taste the baking soda nastiness in that roast chicken or pork chop that those cookies contributed to producing. Kitchen waste is guilt free around my house! Like Alicia – raising chickens has been a great reward. It has freed me from ‘Food Waste Guilt’. Now whenever new recipes flop, I just smile and put it in the chicken food container. Then the next day I receive special ‘Song’s of Praise’ from my hens for the extra goodies. When we were first married and on a tight budget, I tried a vegetarian dish to save money. It was some sort of bulgur wheat and textured vegetable protein meatless loaf. I don’t know why I thought it would be good because even that description is terrible. We sat down to eat, gave it a try, then got up and made peanut butter sandwiches. But like you, I couldn’t throw it out. I cut it into pieces and froze them. After that, any time I made sloppy joes or spaghetti, I would crumble up some of the loaf with my meat. We ended up using it all. And we remember that loaf as the one truly bad meal I ever made. I did the same thing with cookies in college. A group of girls and I went over to an older woman’s home to bake cookies for her and I put salt instead of sugar! I had never used salt out of a bag, who knew there was salt that didn’t have a picture of the little girl with the umbrella? We didn’t have more chocolate chips so we picked all the salty dough off and used them anyway! Laura, I have been following your blog for years and am finally ready to take the plunge and get a wondermill! I just ordered it on amazon. Now what? I’ve been trying to dig through your website and find posts about which kinds of berries/flour to use for what, how to store the berries and how long they last, how many pounds of berries should I buy? Like how many pounds of berries equal how many loaves of bread, etc. Can you direct me? Hahaha!!! French toast is what I thought of before I got to where you said it. When have made a few bad loaves of wheat bread I freeze it too. I have made some good french toast with it too.